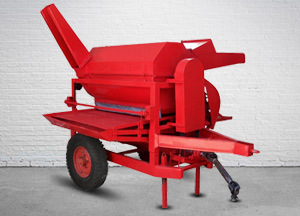 The thresher is operated like conventional wheat thresher by tractor PTO. Its threshing mechanism is based on well-known axial-flow system. The crop is fed into the machine from one end. During the process, the grains are separated and fall down on vibrating sieves where they receive air blow for cleaning. The clean grains are discharged at main grain outlet. The left over un-threshed material is recycled through the threshing drum with the help of an auger conveyor.